As a result of reduced budgets, greater competition in pitching for business and an ongoing requirement for continuing professional development (CPD) for in-house lawyers, clients increasingly began asking for training in the form of online content. Competitors were already delivering online content and Lovells, as a firm, had to keep up to date if we were to continue to compete in the market and enhance Lovells’ client service and range of offerings. In the past, Lovells had worked with an external provider to develop an online compliance awareness course to be used as a Business Development tool. This product proved to be extremely popular and led to discussions with a number of clients about the creation of online training. We had recently been commissioned to create three e-learning modules for a particular client and work had started on this which helped significantly in establishing feasibility of offering a range of services. However, a strategic decision needed to be made as to whether we were going to offer a client e-learning service as part of our official range of offerings. The first step was to identify a senior sponsor within the business. Having such a senior figure helped significantly in lending weight to the project. Once the sponsor had been established, we set up a project team, which included a project manager and a number of directors within the business services departments. This team started work on a study to identify the possible range of offerings and analyse feasibility, cost, resourcing and risks for each of the different options. In our analysis, we found the factor that increased the risk and cost most significantly was the amount of technical integration and support required by the client. Another issue that became clear was that when we started “selling” e-learning to our clients, we were viewed by them as a professional e-learning vendor. They expected a level of service comparable with traditional and experienced e-learning vendors, including a technical team responsible for dealing with questions and technical queries. By the end of our study, we had identified five main levels of service ranging from simple storyboarding in Word or PowerPoint up to the possibility of hosting and tracking on our own internal systems. We then pursued the solution of setting up an agreement with an external provider to supply these services. Number of courses that we would want to host and their size. Number of users that we would expect the site to support. Number of new courses we would develop in a month. Number of downloads per day, per week or per month. Design of front end to the web site that clients would access. Level of security to be provided. Level of technical support to be provided to clients. The advantage of this solution is that the client would deal directly with the external provider and it would be the provider’s responsibility (not Lovells) to resolve any technical issues. The only downside is cost. Hosting and tracking would be charged separately. When starting to talk to clients about possible content in Articulate, we felt an important first step was to ensure the client’s own system met the minimum technical specification to be able to run Articulate presentations. Any specific accessibility issues should also be raised. This was an issue for one of our clients where although technically the Articulate e-learning would function on their systems, it was not deemed to be compatible from an accessibility point of view (visual impairment was the issue). We created a demo Articulate module to check compatibility, before committing to or spending time creating customised content in Articulate. We also created a technical checklist to establish the client’s technical and LMS set-up, Articulate expertise and resource in-house and preferred delivery formats, prior to commencing. We asked for a technical contact within the firm who would be our point of contact for any technical questions or issues. We do not have expertise in-house to assess and support compatibility issues. If Articulate modules are not supported by the client, we would resort to storyboarding only or creation of a standalone version. In the same way, we do not have in-house expertise in LMS programming or resources to be able to work with clients to ensure the LMS version is 100% compatible with the client’s own LMS. We proposed that it should be the client’s responsibility to work with their LMS provider to ensure the Articulate modules can be integrated into their LMS. We can do no more than supply the content in an LMS compliant format. However, although we can propose the client works with their LMS provider, in reality, clients may not be expert at integrating and tweaking modules and may look to us to help them. We could not leave the client with an online course that does not fit into their system. There are reputational risks and the client would be unlikely to come back for more e-learning courses if we were not able to provide a module that they could use. copyright clearance for photos or illustrations and confirmation of who would meet the cost of such items. One of the biggest issues is who clients must ring if they experience problems. Our global support desks are not geared up to deal with client queries. The business would have to decide what resources would be made available to provide support if this option was chosen and what level of support, for example, service hours, would be provided. A process would need to be designed and implemented for reporting faults and issues from users. Depending on client demand and take-up, we would make a decision after a defined period, for example, nine-12 months, as to whether we would want to move in the direction of offering tracking of content in-house. Although we have not yet offered tracking via an external company, this would be our preferred solution so we can minimise risk and learn more about hosting and tracking online content before offering this service in-house. There are two options for tracking externally. The first option is a simple tracking service offered by Articulate, with costs starting at around $1.00 per person per month. The second, higher cost option, is to sign up to a more sophisticated LMS tracking service hosted on an external provider’s servers. Cost: fixed price does not work. Hourly rates provide the only protection against scope creep. In addition, these are premium products and need to be priced as such. Practice interface: the involvement of a partner or senior associate, preferably with a more junior associate on the legal content, is crucial. Clients treat these projects as transactional and expect 24/7 service which we are not resourced to provide. We need the practice to act as a buffer, managing client expectations. Technical interface: if the client is paying, they will always expect us to make the online module work on their system even if this is outside scope. Updating: clients will expect this. It needs to be priced at hourly rates which are reasonably prohibitive. Define project team: a defined project team with clear roles and responsibilities would need to be set up. This would include an overall project manager, a customer relationship manager (CRM), a defined point of contact within the client; a sponsor and champion and technical contacts within Lovells and the client organisation and an Articulate author/editor. Does the potential author need training on Articulate or guidance on e-learning instructional design and/or storyboarding? Does in-house technical or “how do I?” support currently exist for Articulate? Delivery formats: we will need to identify how many different formats are required for delivery of the course. Testing: a testing process will need to be defined and time allowed for testing in the client’s technical environment. Technical support: how will support queries be dealt with? Who will have responsibility for providing support to clients or to potential authors? Look and feel of the finished product: at the start of the project, it will be critical to define the specific instructional treatments required. Sample treatments will be needed at the start of the project and updated prototypes will be needed until the final version of the course is created. Branding will also need to be discussed. It may be that the client wants a specific colour scheme or inclusion of their logo. Quality control: technical set-up, online layout and instructional design best practice. What roles will team members play in quality assurance and approval of published content? How will the different options be charged? Level of customisation: none (off-the-shelf standard modules); minimal (tweaking of content or look and feel) or fully customised content developed from scratch. Contract: will include ownership of content, deliverables, delivery format for the deliverables, maintaining and updating content; supporting users (technical and content). Ownership: who will own the content? Are clients to be charged more if they take ownership of the content? Is there a risk that the client will re-sell the content to their own clients? Editing the content: who is responsible for updating and maintaining the content and at what stage should additional charges be made? In-house staffing levels: how many resources and how much time do they have available to be able to create and update content for clients? Do you need to evaluate whether additional resources need to be recruited. For one of our clients, the time spent on storyboarding, creating content and amending content ran into hundreds of hours for three one-hour modules. So far, clients have been happy for the content to be produced in Articulate but, moving forward, we will need to offer a wider selection of tools and treatment of content. E-learning authoring is not Lovells key business and we have no graphic design or technical support capability in-house. We are therefore looking to build content with a third party provider, which goes beyond the standard interactions provided by Articulate, and which contains an innovative treatment in terms of graphic design. We have no plans to purchase additional e-learning authoring tools to meet client demand – we would look to an external organisation to develop content using any other tools or technology. We have limited resource in terms of Articulate authors in-house and if there is a large demand in the future we would need to consider using an additional authoring resource. Lovells has selected Articulate as our e-learning authoring tool of choice and has no intention of acquiring additional e-learning authoring tools. If a client specifically requests content to be created in another authoring tool, we would look to our external provider to produce content in that particular tool, such as Atlantic Link, or format, such as Flash. Lovells has no graphic design expertise in creating e-learning and we would look to an external provider to produce this capability and expertise. Lovells has no platform or infrastructure on which to host e-learning for clients and has no immediate strategy to provide this service in-house. We would look to an external provider to provide a fully supported hosting service both for Lovells own developed content and for content provided by a third party. Lovells has no technology or infrastructure to be able to track or report on e-learning usage. We would look to an external provider to provide a competitively priced tracking solution with a range of options for both Lovells and third party produced content. Our support desks are not resourced nor trained to provide technical support for client e-learning. Our only option is to engage the services of an external provider. In summary, although there are risks associated with providing e-learning for clients, these risks can be minimised as long as clients’ expectations can be managed and there is awareness and clarity about what services are feasible to provide. We welcome the opportunity of working with external providers in the future to provide clients with an enhanced range of offerings in the field of e-learning. 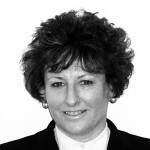 Claire joined Lovells in 2003 as global IT Training Manager. She then took over the management of the legal training team and for the last two years has taken on the role of Learning Technologies Manager, responsible for implementing technology across all areas of learning. Claire specialises in harnessing technology to optimise accessibility to learning. She introduced virtual classroom technology and online learning to Lovells over five years ago. Prior to joining Lovells, Claire was with Goldman Sachs for 12 years, where she travelled the globe delivering IT training. In her final role, she was Executive Director, in charge of global IT training for Investment Banking. Claire has been a member of the eLearning Network Committee for the last four years, holding the position of Vice-Chair for the last two. She has organised a number of events and has been involved in judging the national eLearning awards. She has presented at a number of learning technology conferences in the UK and in Europe. Lovells is one of the largest international business legal practices, with over 3,000 people operating from 26 offices in Europe, Asia and the United States. The firm advises many of the world’s largest corporations, financial institutions and government organisations. We regularly act on complex, multi-jurisdictional transactions and commercial disputes, and offer a wide range of legal advisory expertise to our clients.